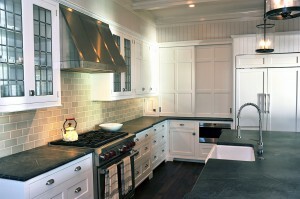 One of our dealers recently completed an amazing kitchen design using our handmade Affinity tiles as the backsplash. Affinity is an inspired collection of handmade tile, offering an array of sophisticated ceramic glaze colors. The meek neutral tones and rich colors ignite creativity. The versatile tile sizes can be installed in various arrangements, and the colors can be blended to create a unique design. Affinity is sure to enhance interior residential and commercial spaces like no other glaze collection.